Promoted Trends are a new advertising concept we began testing this week; they are an extension of our Promoted Tweets platform. With Promoted Trends, users will see time-, context- and event-sensitive trends promoted by our advertising partners. These Promoted Trends initially appear at the bottom of the Trending Topics list on Twitter and are clearly marked ‘Promoted.’ As conversations about the topic increase, Promoted Trends may move up the list. Furthermore, a topic must already be in discussion on Twitter in order to become a Promoted Trend. It will appear at the bottom of Twitter’s top 10 list of trending topics. When you click on the Promoted Trend, you are given a search results page to see what people are saying about that particular subject. Just like with Promoted Tweets, the Promoted Trend topic has to “resonate” with the Twitter community or it will disappear. The feature is currently still being tested before Twitter decides whether or not to keep it. “As we have always said, we plan to test different advertising and promotional models in these early stages of our monetization efforts,” said a Twitter spokeswoman, according to Jessica Guyn at The Los Angeles Times‘s Technology blog. The first guinea pig was Disney’s Pixar, who did a Promoted Trend campaign for its new movie release, Toy Story 3. 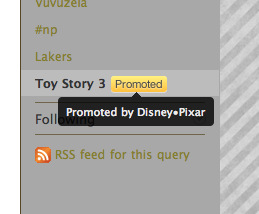 Pixar was also given a Promoted Tweet at the top of the stream as part of its Twitter package. Coca-Cola is the second company to try the new feature. Within 24 hours, the company achieved 86 million impressions and a six-percent engagement rate for its World Cup campaign. “The amount of impressions in such a short period of time[…], to me it was a phenomenal time,” said Carol Kruse, Vice President of Global Interactive Marketing. The price that Pixar and Coca-Cola paid for their campaigns has not been made public. Kruse has said that the expense was small relative to other ad buys. Screen capture of Toy Story 3 Promoted Trend used under Fair Use: Reporting.